Conflicting names of ancestor's parents from different records? I believe I have found my great-grandmother in the 1926 census of the prairie provinces. https://www.bac-lac.gc.ca/eng/census/1926/Pages/item.aspx?itemid=890822 Line 6 in the image. However, the names of her parents keeps changing in the records. On her death cert it says Edward O’Brien of Ireland was her father with an unknown mother. On the 1901 census it says her mother is Norah O’Brien and the head of the household is Edward Goode but it doesn’t say what relation he has to her. I found a marriage cert that has a marriage between Norah O’Brien and George Edward Goode. I guess it could be that she didn't take her husband's last name. I suggest you obtain a copy of Winifred's birth certificate. It can be ordered from the GRO website. As you can see, the Mother's maiden surname is given as a dash, indicating she was very likely illegitimate. The most likely explanation is that Winifred's mother was unmarried when Winifred was born. Whether Edward Goode was her biological father is impossible to say without further evidence. As you say, Norah appears to have married George Edward Goode in December 1901 (remember the census was taken in March 1901, before they were married). DNA testing can be useful to sort out paternity in some cases where there is a recent illegitimacy. Not the answer you're looking for? 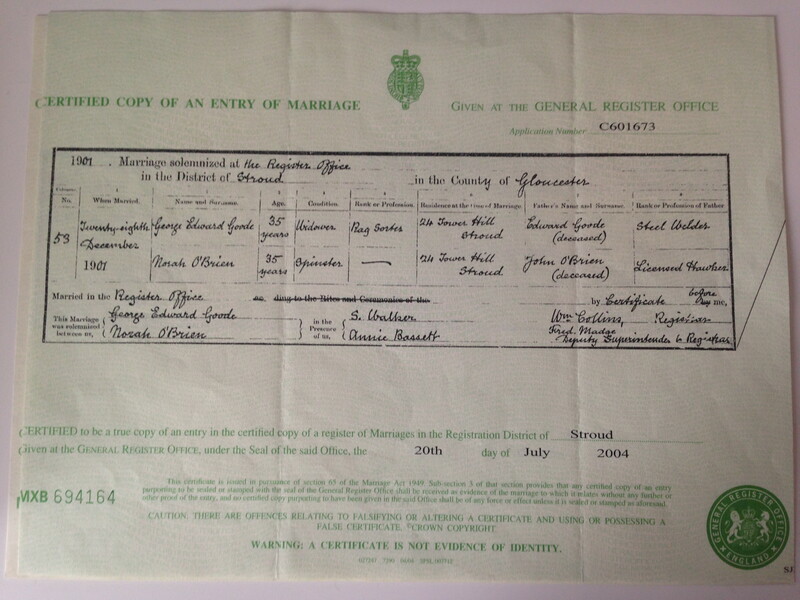 Browse other questions tagged england marriage-records surnames vital-records canada or ask your own question. Locating an elusive UK birth record (Mary Ann Harper born circa 1865 possibly Dudley, England)? Where is the Marriage of Milly Bungay/Mason/Weston to John Weston? Where is the marriage of F. M. Weston/Mason to a Goodman? Where is the 1911 Census record relating to Milly Bungay/Mason/Weston? Can I determine the relationship between Mary Anne Wright (nee Harper) and Charles William Kimmons? What was surname of Susan/Susanna, wife of Edward McDowell, from Devon area in abt 1800? Seeking marriage record of John McGrady and Elizabeth McDonald in Ireland about 1885? How should I interpret this sequence of records?